Was born in 1984, and grows to this day. He studied and graduated in Computer Engineering on the axis Padua-Barcelona. acronyms like OOP, MVC, RAD, ORM. Forms his skills through individual and team work. He uses git. Since 2007 and its 1.0 version he thinks that Symfony is the tool to focus firmly on. within an agency that, for medium-to-large customers, implements projects also-very-complex with gun-to-temples deadlines. He's the creator and developer of symfonybricks.com, a web platform based on Symfony2 and released itself open source. and at the same time it offers its own source code as an example of best practices. 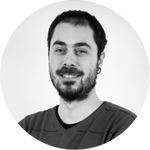 He is co-creator and co-developer of CopiaincollaMetaTagsBundle, a bundle for Symfony2 to manage dynamic html meta tags.